This article is based on a talk in Chris Budd's ongoing Gresham College lecture series. You can see a video of the talk below and see other articles based on the talk here. There are few things more impressive than a flock of starlings performing its perfectly choreographed dance in the sky. Thousands of individuals move together as if they formed a single, coordinated, fluid organism. How does each starling know where to go? And who directs the performance? "Nobody," is the answer. 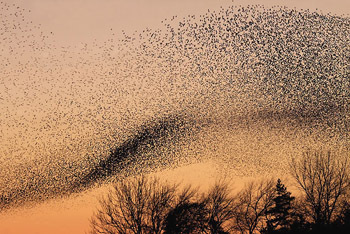 The dance of the starlings is an example of emergent behaviour. In this a large scale effect, or pattern, emerges from the interaction of all of the components of a system, rather than the individual behaviour of the components. Emergence is a defining property of complex systems where the collective behaviour is different from the sum of the parts of the system. Much of this behaviour has evolved to counter predators such as hawks. The flock, whilst made up of birds which are small, collectively behaves as though it were much larger. This often causes a predatory hawk to become confused and to break off the attack. The behaviour of the flock is governed by the way the starlings interact with each other. Each starling has "rules" for how to react to nearby birds, such as getting closer to some birds, staying further away from others, and aligning themselves with the overall flow. The combination of these individual rules is the emergence of the collective behaviour of the flock. (To find out more about these rules operate see this article). We also see similar collective behaviour in shoals of fish, particularly when they are trying to avoid predators (see the video below). When under threat the shoal arranges itself into a ball and that's a very good idea indeed: any other 3D shape would have a larger surface area than the ball and so offer the predator a larger area to attack (find out more here). As with the starlings it may seem that the fishes' action has been coordinated to maximise their chance of survival, but that's not the case. The spherical shape of the shoal is a result of each individual fish trying to hide in the interior of the shoal to keep safe. In this case, the selfish behaviour of individuals results in an emergent form that is good for everyone. Many animals exhibit similar collective behaviour. Termites, bees, herds of cows, and crowds of people in places such as railway stations and sports stadia are other examples. Emergent behaviour also exists in systems whose individual components don't possess a mind of their own or anything resembling consciousness. Beautiful examples can be seen on the bodies of many animals, from leopards, zebras and tigers, to butterflies and beetles. A first mathematical study of animal patterns was made in 1940s by the great Alan Turing (of computer and code breaking fame) and they were found to be generated by reaction-diffusion mechanisms. In Turing's model two substances in the animal skin diffuse and react to each other in a way that can be described by differential equations. The equations have solutions that display strongly ordered patterns. It is possible to analyse the types of patterns which arise, and to explain why there are spotted and striped coat patterns. These models are also predictive and lead to the important mathematical result that spotty animals can have striped tails, but striped animals can't have spotty tails (you can find out more here). 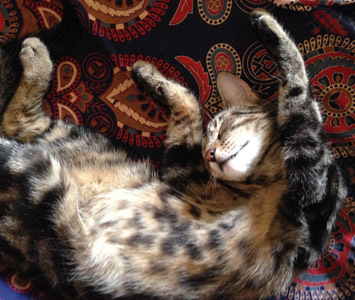 This lazy tabby cat may have a spotted belly, but because most of his body is striped, maths dictates that he can't have a spotted tail. 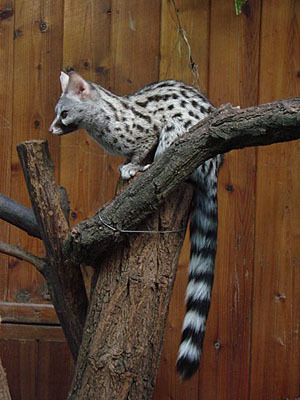 However, spotted bodies and stripy tails are allowed, as this genet illustrates. Photo: Guérin Nicolas, CC BY-SA 3.0. 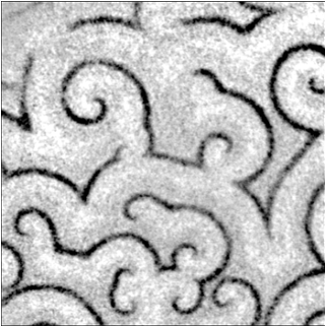 Another beautiful example of a reaction-diffusion mechanism is the pattern below, called a scroll wave, and generated by the dictyostelium slime mould. The process can be given a mathematical formulation and simulated using a mathematical system called a cellular automaton (see here for an introduction to cellular automata and here for more on the specific example of the slime mould). Emergent behaviour also exists in very large scales: an example is the lovely spiral structure of galaxies which emerges from the complex interactions of many, many, stars under the action of gravitational forces. 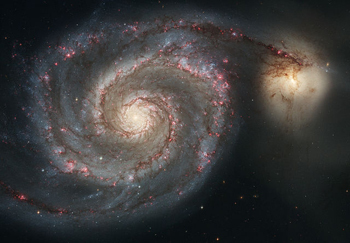 Figure 6: The Whirlpool Galaxy. Image courtesy NASA/ESA. It's often the case that emergent behaviours are "simpler" than the behaviour of the individual components. Liquids are perhaps the best example of this. The motion of a liquid, such as water, is the result of the complex interaction of many millions of individual molecules, but can be a simple as a steady flow in one direction. This simplicity allows us to describe liquids by straightforward mathematical rules, and we can also classify some of the most likely forms the behaviour can take. Another murmuration of starlings. Photo: Walter Baxter, CC BY-SA 2.0. Much has been written about emergent behaviour, and extravagant claims have been made for it. It is claimed that order will generally emerge from the random interaction of a complex system's components if we leave them to themselves. My own studies of such complex systems indicate that this is far from the case, and that whilst simple ordered patterns can emerge, it is usually more common to see disorder instead. Certainly I find rather far-fetched the claims that consciousness is just an example of an emergent phenomenon. Patterns which are constant, with everything staying the same, or are slowly varying. Periodic repeating patterns, such as stripes and spots on animal skins and coats. Chaotic patterns, which look disordered but are in fact highly structured. 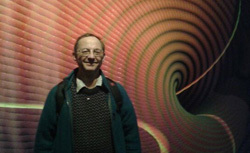 In the next two articles we will look at some of the ways in which mathematical models and algorithms can reproduce some of the patterns that we have observed above in complex systems: the first article looks at the deceptively simple concept of agent based models. Enjoy! This article is based on a talk in Budd's ongoing Gresham College lecture series (see video above). You can see other articles based on the talk here.